FileMaker Server deployed on a Mac server – Tested with OSX 10.11 but may work with other versions. 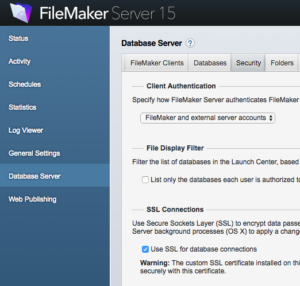 The “FileMaker Database Server Website” page must be reachable through the public internet using a web browser at the address you wish to get an SSL certificate for, such as http://myserver.mycompany.com. This means opening or forwarding port 80 in your router, firewall, or security groups. We use the Let’s Encrypt HTTP verification challenge, so we must make sure that Let’s Encrypt is able to reach our FileMaker server through HTTP. First, you’ll need a copy of the GetSSL shell script. Download the file using the link below and save it on your server where you’ll want to get the SSL certificate. Warning: This is an experimental script and procedure, and SSL certificates from Let’s Encrypt are not officially supported by FileMaker, Inc. Please download and use this script with the understanding that it comes with no guarantees or warranties, and that you are doing so at your own risk. Blue Feather, Let’s Encrypt, nor anyone else are responsible for what happens to your server or systems when using this script. The script file needs to be edited so that it know the address you wish to get an SSL certificate for. Open the script in a text editor like TextEdit, TextWrangler, Sublime Text, or through Terminal using an editor like Vim. Change the address, email address, and (if necessary) the FileMaker Server install path variables to reflect your server’s information and your contact information. Let’s Encrypt will use this contact information to reach out to you if there is a problem with the SSL certificate that they have issued to you. WARNING: Running this shell script will safely restart your FileMaker Server service, abruptly disconnecting any active users. Make sure that nobody is connected to your server before you run this script. A bunch of text will scroll by in the Terminal window as the script requests, fetches, and installs your SSL certificate. Your FileMaker Server service will then be stopped and started again automatically. Your SSL certificate should now be installed! Go to your FileMaker Server admin console to make sure you’re seeing the new SSL certificate. You may need to close and re-open your browser if you had the page open already. The SSL certificate is installed, but we want to force FileMaker Pro and Go clients to connect securely to our server. Log in to your newly secured FileMaker Server admin console. Select the Database Server options from the list on the left and then the Security tab at the top of the page. Check the “Use SSL for database connections” option (as well as “Use SSL for progressive downloading” if you would like) to force FileMaker Pro and Go clients to use a secure connection when connecting to this server. Save your changes and then restart your whole FileMaker Server machine or just the FileMaker Server background service. Your FileMaker Pro clients should now show the green lock icon when logging in to this server, indicating that the connection is secure. SSL Certificates from Let’s Encrypt are only valid for 90 days and must be renewed before that time. Let’s Encrypt does this purposefully to encourage automation and increase security. In that spirit, we should set up an automatic renewal for our SSL certificates so that we don’t need to manually re-run this every couple of months. This process is similar to setting up a scheduled script in FileMaker Server. Move the GetSSL.sh file to a relatively permanent location on your server. An example place for this might be /usr/local/bin/. You’ll need to create a LaunchDaemon schedule to run the script at the dates and times you want to do it. A LaunchDaemon will run your scheduled program or task at the dates and times, or at the interval, that you specify. These certificates are good for 90 days at a time, and the Certbot tool we’re using will only renew them once they’re at least 30 days out from renewal. You will want to create a .plist file to schedule this in a way which makes the most sense for you. You can have it run once per week, for example, and it will renew your certificate when it becomes eligible for renewal (It will still restart your FM Server at your scheduled time, even if there isn’t a new certificate – I’d like to update this in the future to only restart if there’s a new certificate.). You can use the example .plist file available at the download link below. You can download and edit this example file to run your GetSSL.sh script at the location you stored it at and on the days you want. This example one is scheduled to run once per week, on Saturdays at 6:21 pm. You can read more about writing your own LaunchDaemons from the Apple Developer site. As an alternative, there’s a great app called Lingon X which give you a really nice GUI for creating, editing, and installing LaunchDaemons. A demo is available, and a single-user license is $9.99, which may be worthwhile as it makes creating and scheduling LaunchDaemons very easy. That’s all that you need to do! Your script should run automatically at your scheduled time to renew your SSL certificate with Let’s Encrypt. Do a test to make sure that it’s all working properly, that it gets a new certificate for you, and that your FileMaker Server service restarts after it has retrieved the certificate. If there is an issue, you may want to run the script manually in PowerShell or debug with the PowerShell ISE to locate any issues. Keep in mind that your FileMaker Server service will be restarted after getting the new SSL certificate, so be sure to schedule it for a time when people will not be active in your system. This is an early version of this script and there is quite surely room for improvement. Please let me know if you have any suggestions or run into any issues using this scripting. Let’s make the FileMaker community a secure one! This project is also available for download through GitHub.